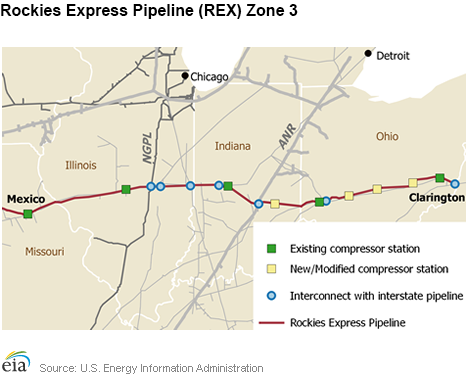 On January 5, Tallgrass Energy and Rockies Express Pipeline LLC (REX) announced the completion of the Zone Three Capacity Enhancement Project, providing an additional 800 million cubic feet per day (MMcf/d) of east-to-west capacity out of Ohio and into Midwestern markets. The recently completed capacity expansion project has increased REX's Zone 3 east-to-west capacity to 2.6 billion cubic feet per day (Bcf/d) by adding three additional compressor stations and upgrading two others. The project received approval from FERC in March of 2015; it is estimated to have cost $532 million. Capacity on the east-to-west expansion is currently fully subscribed under long-term contracts. In its first full week of service, east-to-west flows have been close to full capacity, averaging 2.6 Bcf/d at the Chandlersville compressor station in central Ohio (PointLogic Energy). Zone 3 has 20 different pipeline interconnects and delivery points, which has expanded markets for Appalachian natural gas. This includes interconnects with several major interstate pipelines, the largest of which are with Natural Gas Pipeline of America (NGPL) and ANR Pipeline. These interconnects also see the greatest throughput, both averaging 764 MMcf/d over the last two months (PointLogic Energy). NGPL extends from the Permian basin and Texas Gulf Coast into the Chicago market; its REX interconnect at Moultrie, Illinois, has a capacity of 1.55 Bcf, which was recently expanded as part of its Chicago Market Expansion Project. ANR has a 1.25 Bcf/d interconnect with REX at Shelbyville, Indiana, that provides access to upper Midwest markets, including Detroit and the Dawn hub in eastern Canada. In addition to providing access to Midwestern markets, both pipelines will also connect Appalachian natural gas to the Gulf Coast, which is evolving into a demand center as liquefied natural gas export and petrochemical facilities come online. Completed in November 2009, the 1.8 Bcf/d REX pipeline extended 1,713 miles and was built to move natural gas from Colorado and Wyoming to eastern Ohio. 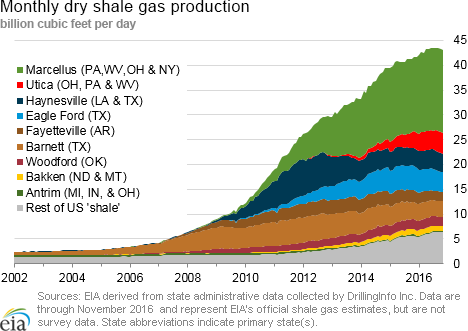 The emergence of shale gas production in the Marcellus and Utica basins, however, transformed the Northeast into a major supply region for natural gas. As a result, Tallgrass initiated a project to provide east-to-west reversal on REX's Zone 3 in August 2013, which came into service in August 2015. The project provided full bidirectional flow of 1.8 Bcf/d between Clarington, Ohio, and Mexico, Missouri. Natural gas spot prices fell at most locations this report week (Wednesday, January 4 to Wednesday, January 11). 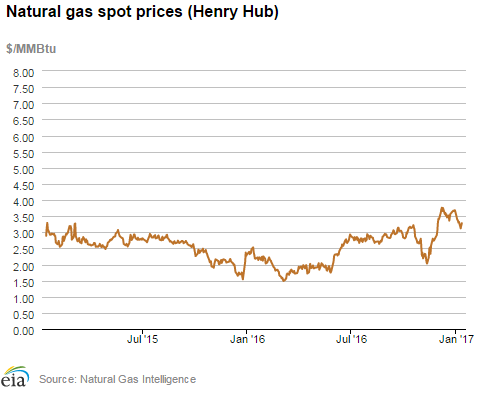 The Henry Hub spot price fell from $3.37 per million British thermal units (MMBtu) last Wednesday to $3.28/MMBtu yesterday. At the New York Mercantile Exchange (Nymex), the February 2017 contract fell 4¢ from $3.267/MMBtu last Wednesday to $3.224/MMBtu yesterday. Net withdrawals from working gas storage totaled 151 billion cubic feet (Bcf) for the week ending January 6. Working natural gas stocks are 3,160 Bcf, which is 10% less than the year-ago level and the nearly the same as the five-year (2012–16) average for this week. The natural gas plant liquids composite price at Mont Belvieu, Texas, fell by 27¢, closing at $6.87/MMBtu for the week ending January 6. The price of ethane, butane, and isobutane fell by 12%, 16%, and 4%, respectively. The price of natural gasoline and propane both rose by 3%. According to Baker Hughes, for the week ending Friday, January 6, the natural gas rig count increased by 3 to 135. The number of oil-directed rigs rose by 4 to 529. The total rig count climbed by 7 and now stands at 665. Prices decline across the United States. This report week (Wednesday, January 4 to Wednesday, January 11), the Henry Hub spot price fell 9¢ from $3.37/MMBtu last Wednesday to $3.28/MMBtu yesterday. Prices generally decreased across all regions as the week began with extremely cold polar vortex weather, which peaked on Friday, and then temperatures moderated through yesterday. At the Chicago Citygate, prices decreased 24¢ from $3.49/MMBtu last Wednesday to $3.25/MMBtu yesterday. Prices at PG&E Citygate in Northern California lost 4¢, down from $3.57/MMBtu last Wednesday to $3.53/MMBtu yesterday. The price at SoCal Citygate decreased 11¢ to $3.50/MMBtu yesterday. Northeast prices decrease substantially week over week. At the Algonquin Citygate, which serves Boston-area consumers, prices went down by nearly half, from $6.67/MMBtu last Wednesday to $3.40 yesterday. The Algonquin spot price peaked on Friday at $9.09/MMBtu, corresponding to the coldest weather for the report period. This week's price peak is not the highest the price has reached this winter, but recent pipeline capacity expansions may reduce weather-driven price volatility in the Northeast. For example, the Algonquin spot price reached $78.30/MMBtu in January 2014 (although prices for most consumers are insulated from swings in the spot prices through physical—i.e., storage —and financial hedges). At the Transcontinental Pipeline Zone 6 trading point for New York, prices decreased $1.47 from $4.50/MMBtu last Wednesday to $3.03/MMBtu yesterday. Similarly to Algonquin, the Transco Zone 6 price peaked on Friday at $7.85/MMBtu. Tennessee Zone 4 Marcellus spot prices decreased 19¢ from $2.88/MMBtu last Wednesday to $2.69/MMBtu yesterday. Prices at Dominion South in northwest Pennsylvania fell 32¢ from $3.13/MMBtu last Wednesday to $2.81/MMBtu yesterday. The price of the February 2017 Nymex contract falls. At the Nymex, the price of the February 2017 contract decreased 4¢, from $3.267/MMBtu last Wednesday to $3.224/MMBtu yesterday. The price of the 12-month strip averaging February 2017 through January 2018 futures contracts climbed 2¢ to $3.306/MMBtu. Supply remains flat this week. According to data from PointLogic, the average total supply of natural gas remained the same as the previous report week, averaging 77.3 Bcf/d. Dry natural gas production decreased by 2% compared with the previous report week. Average net imports from Canada increased by 14% from last week. Demand continues to increase because of cold winter temperatures. Total U.S. consumption of natural gas rose by 27% compared with the previous report week, according to data from PointLogic. Overall, weather for this report week was colder than the previous week. Daily consumption peaked on Friday as extremely cold weather prevailed across the country. Intra-week consumption ranged from the Friday peak of 136.1 Bcf to 85.3 Bcf yesterday. Week over week, power burn climbed by 35%, industrial sector consumption increased by 7%, and residential and commercial sector consumption increased by 35%. Natural gas exports to Mexico increased 6%. U.S. liquefied natural gas (LNG) exports. Natural gas pipeline flows to the Sabine Pass liquefaction terminal averaged 1.6 Bcf/d for the report week, 1% higher than flows last week. Three vessels (combined LNG-carrying capacity of 10.5 Bcf) departed Sabine Pass last week, and one vessel (3.8 Bcf) is currently loading at the terminal. In December, 12 cargoes were exported from the terminal, exceeding the previous monthly record set in November, with 10 exported cargoes. The majority (8 cargoes) were shipped to Asia, as cold winter temperatures and increasing spot LNG prices in the region supported demand for additional LNG imports. Return of cold temperatures contributes to increased withdrawals from storage. Net withdrawals from storage totaled 151 Bcf, compared with the five-year (2012–16) average net withdrawal of 167 Bcf and last year's net withdrawal of 152 Bcf during the same week. Increased heating demand for natural gas contributed to the increased rate of withdrawals compared with the week ending December 30, 2016, when net withdrawals totaled 49 Bcf. Working gas stocks total 3,160 Bcf, which is 4 Bcf less than the five-year average and 363 Bcf less than last year at this time. Working gas levels in the East and Pacific regions are significantly below their five-year average. East and Pacific regions working gas levels fell below their five-year average. Working gas levels are 52 Bcf below the five-year average in in the East region, and 36 Bcf below the five-year average in the Pacific region. In contrast, working gas levels in the Mountain and South Central regions are 24 and 46 Bcf above their five-year averages, respectively. Working gas levels in all regions were well above their five-year average levels at the start of the heating season. Net withdrawals exceed market expectations, prices rally at WNGSR release. According to the Bloomberg survey of natural gas analysts, estimates of net natural gas withdrawals from storage ranged from 132 Bcf to 160 Bcf, with a median of 144 Bcf. The price of the Nymex futures contract for February 2017 delivery at Henry Hub rose 4¢/MMBtu to $3.41/MMBtu, with 1,153 trades executed, at the release of EIA's Weekly Natural Gas Storage Report (WNGSR). Prices varied in subsequent trading, climbing to $3.44/MMBtu within two minutes of the release. Temperatures drop week over week, and are below seasonal norms. Average temperatures in the Lower 48 states fell 6°F on the week and averaged 37°F. Temperatures in most regions were above the normal levels for the period, with the exceptions of the Pacific and Mountain regions. The falling temperatures this week increased heating demand for natural gas. Heating degree-days (HDD) in the Lower 48 states totaled 197, compared with the week-ago level of 161, and the normal level of 222.